Carpenter ants vary in size and color but are usually large (1/4-1/2 inch) and are black. Occasionally, swarms of winged carpenter ants will emerge inside your home. One way to identify Carpenter ants is to observe if the ants are all different sizes. This means they are polymorphic. 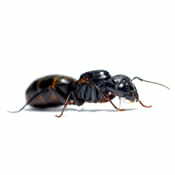 Carpenter ants are polymorphic and black, sometimes with a burgundy thorax (middle body part). Carpenter ant swarms usually occur in the spring and are a sure sign that a colony is nesting somewhere near or even inside your home. Using some of the least toxic and effective products for ant control on the market.We pride ourselves on bringing you ant control treatments that exceed industry standards. “When used by a licensed pest control technician undetectable’s are the best way to get rid of ants in and around your home and yard.” -Billy Olesen, A.C.E.